The Woodland Kingfisher, Halcyon Senegalensis, is an amazingly striking bird. Colourful and noisy (it has a loud trill as its call), it is easily noticed. So far this year, we have not seen nor heard a single Woodland Kingfisher and that, for me, is very bad news. 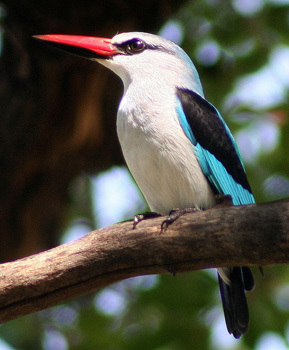 The Woodland Kingfisher eats insects, not fish. The fact it is not around is because there has been minimal rain. After good rain, large quantities of insects emerge – so the absence of the Woodland Kingfisher is an alarming natural indicator that we are in the throes of a very serious drought. I recall in 1992 that a similar drought took its cruel toll on the Kruger Park and that the Woodland Kingfisher was first seen in January 1993. In my last letter, I was on about food wastage – now we are threatened with a devastating drought and we need to save every drop of water. Of course it is difficult to advise paying guests to take short showers and check that the water is NOT running while brushing their teeth. What I have done is to appoint a designated staff member to check on all taps once the guests have vacated their rooms. Our water comes from boreholes but in 1992 a number of lodges in the area (thankfully excluding ours) experienced dry boreholes as the water table kept dropping. One positive consequence of water shortage is that all the animals in the reserves are easily seen. There is no grass so depth of vision into the bush is excellent and the animals are forced to come to the water points. Just about every waterhole has its resident pride of lions camped there and our guests are seeing most unusual sightings. I personally saw herds of over 1000 buffalo and 150 elephants. Luke told me of a day in Kruger in which his guests had a sighting of an elephant charging thirsty Wild Dogs at a waterhole and at another waterhole a Leopard angrily moving off from the water because another elephant chased it off. I personally on one day saw 2 sightings of a treed leopard (leopard chased up a tree) by lions at waterholes. The Lowveld is very hot, dusty and dry. The animals are feeding along the river because water is available. The water level of the Olifants River is very low and we can cross the river without having problems with crocodiles. During a bush walk this month we saw a crocodile walking on the land and taking a dead bushbuck into the water. 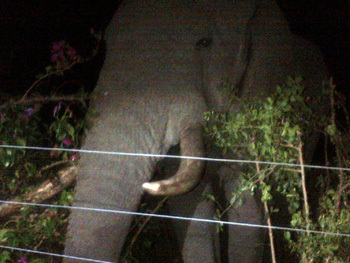 We left the lodge before sunrise and along the way were lucky to find two big elephants bulls breaking a tree. It was very interesting to see elephants knocking the tree down and feeding on it. On the walk we tracked two black rhinos for almost an hour and finally found them taking a mud bath along the stream. The next day I did a walk again with Rex – we heard lions roaring very close to us and we went looking for them. They kept moving away from us. It was very thrilling experience for the guests. Everyone was relaxing around the pool during the heat of the day, I was in my room and heard a bush pig screaming for a long time. I went out on foot to check. On my way to the dam three warthogs came running very fast straight towards me and I had to move out of the way. I decided to go back with a Landcruiser. There were lots of vultures waiting on the tops of trees. Three lionesses and two young male lions had killed a Bushpig. 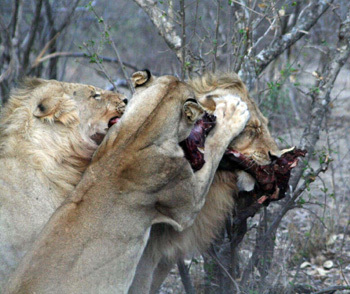 They lions were fighting because the meat was not enough. 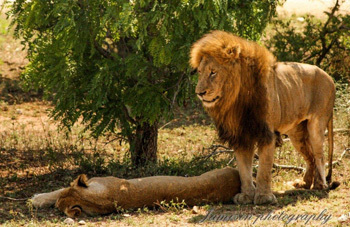 It was the second kill this month – a male lion killed a giraffe a week earlier. The end of the day has come. The sun is setting beautifully over the Drakensberg mountain range. Soon it will disappear from sight, leaving a red glow in the sky. We are only seconds from the gate, when I notice a shape moving on our right. Buffalo ! This is what Kruger is all about – you just never know what might pop out from behind the trees. The Timbavati River runs along the main stretch of road from Orpen to Satara. The rains have been poor this year and this is evident along this stretch of river, which is mainly just dry sand. The sections that have water attract a variety of animal life, which sometimes includes the big cats. The first clue we had was a small line of vehicles. The smell of rotting meat was in the air, not a pleasant aroma. There down in the river bed, lay three big male lions, with full tummies. The big cats had managed to take down a buffalo. 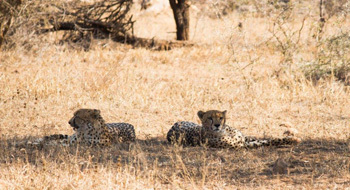 During lunch at Satara, I heard about a sighting of two cheetahs – off we went. On the way we stopped for a herd of elephants. The youngsters stuck to their mothers’ sides, sheltering from the sun. The smallest was only a few weeks old, with little pink ears and a trunk and a mind of its own. The two male cheetahs hadn’t moved all day – they were lying in the shade, not far from the road. They sat up every now and then to check for possible dinner options. The afternoon was cooling down and the animals began to venture out from the shade. At the water holes the buffalo patiently wait their turn while the elephants enjoy a much needed drink. The shape of a rhino is difficult to confuse with anything else, with the large horn and robust body. We spotted one moving away from us in the distance. It was only the leopard that remained – we had already had an awesome day. Did we have any luck left ? 10 minutes later, alongside the road, was a leopard. The beautiful creature moved off slowly, taking its time to methodically take in all the smells around him. It looked back towards us and then moved off into the thick bush, a great way to end the day. Driving around Satara makes one’s job so simple with its high population of predators. On the 18th we found two lionesses and one male lion at Girivana waterhole. They were sitting next to the road. We drove to the S100 – a road along the Nwanetsi river. We found 4 male lions and two lionesses. A pair was mating. The other 3 males crossed between two Viva Safaris open game viewers. We later found a very relaxed leopard in a Sycamore Fig tree – that helped us to complete our big 5 of the day. The next day, at a waterhole, we found a cheetah sitting under a tree and a few metres away a male leopard lying on a Sausage Tree. As we left Orpen gate we found a female cheetah with two cubs crossing the road. Lions were seen on a buffalo kill, so we had great sightings of all the big cats ! There have been great sightings of lions all month mainly on the Barnard property. We have had sightings of lions on 5 kills this month including two on our own Tremisana property ! The Tremisana Dam is attracting the lions. We are seeing the pride of 10 regularly. Morning bushwalks have been good with sightings of elephants and Black Rhino. Hippos and crocodile out of water are seen daily and a big herd of buffalo about 200 plus are frequenting the area where we walk. We found some baby jackals on the walk. On the 29th our Sunset drive produced 2 elephant bulls and female leopard that stayed with us for over 15 minutes. Wow ! I have seen lions every single day in Kruger. 1st : Near the Timbavati Picnic site, we had sightings of 3 of the Big Five within 500 metres: leopard, rhinos and elephants very close. 2nd : 4 lions at Timbavati riverbed with zebra kill busy eating. Leopard crossing the road at Orpen road after Bobbejaankrans, buffalos crossing before the last gate at Orpen, 5 rhinos lying down. 4th : Hyenas on Orpen road, 4 lions at Timbavati riverbed, 7 lions at Mazithi Dam. Buffalo herd at Mazithi. 6th : 6 lions at Timbavati riverbed, rhino at the main road before S127and leopard on Sweni road under the Nyala tree towards Welverdiend waterhole. 7th : 9 lions at Mazithi dam and rhino nearby. Leopard at Sweni road crossing and 2 cheetahs lying down. Lions everywhere. 8th : Lions at Girivana. Leopard S40 crossing to the rocky hills and rhino near S127. 10th : Lions at S36 after the bird hide towards Roodewal camp (11) a pride, elephant bird hide drinking and buffalos at S127 road. 12th : On S100 road after hippo view point a male lion eating impala. On the next view near Timbavati riverbed 3 males trying buffalo herd and a rhino on the other side of the river lying down. 13th : Orpen road T-junction Bobbejaankrans mating lion pair lying down, 5 white rhinos nearby. 14th : Lions after T-junction Bobbejaankrans, Timbavati riverbed buffalo herd drinking and 4 rhinos. 15th : 6 km from T-junction Bobbejaankrans S100 4 males lying down, buffalos Nwanetsi bridge drinking. 21st : Timbavati riverbed 3 male lions laying down, 3 cheetahs on S40 near Girivana T-junction. Rhino Sweni road. 22nd : 3 lions at Timbavati riverbed, white rhinos on S39 and Sweni Cheetahs lying down and buffalos on S36 towards Rockvale water hole. 24th : Elephants drinking Timbavati riverbed, rhino grazing on the riverbed and 6 lions at Rockvale with buffalo kill and hyenas at Orpen road and buffalo herd before the last gate. 26th : Orpen road Timbavati riverbed 3 lions trying to attack buffalo herd. Hyenas Orpen road, elephants drinking Timbavati riverbed, leopard hanging in tree at S125, 3 km from the main road, Sable Antelope at Talamati road after Talamati windmill and African Wild Dogs at Rabelais 1 km from the T-junction Talamati road. Brilliant day: leopard, hyenas and wild dogs plus sable antelope. Wow ! 27th : 3 lions on S100 and 2 rhinos again S100 very close to the lions, elephants Sweni road and 3 lions at Sweni windmill lying down and before the last gate buffalo herd on the road. This month has been a great month for brilliant lion and rhino sightings. We had a fantastic lion sighting at Ezulwini. The lions had made a giraffe kill and were on the kill for a few days. On a day in Kruger we managed to get great sightings of the all big 5, including at least 3 good lion sightings one of which was on a giraffe kill right next to the road. One leopard cub, some great buffalos crossing the road, a cheetah lying in the shade, great sighting of elephants playing in the river and drinking and then two excellent rhino sightings, one of which was a female with a really small calf which was playing and pretending to charge us. On another occasion we got beautiful mating lions right next to the road near the Orpen gate.We also got some great hyena sightings right next to the road with one small cub that was playing and acting silly. A nice treat. On another morning we managed to get eight lionesses with cubs. We spent easily an hour with them while the cubs were climbing trees and chasing one another around. Awesome ! 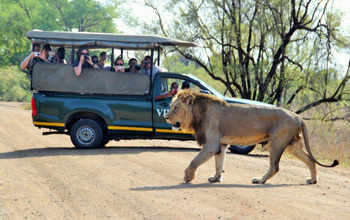 On another occasion in Kruger we were very blessed to see 5 big male lions close by that had just made a buffalo kill. We watched them for a while then the elephants came and chased one of the lions from the kill while the others were lying in the shade panting from the heat. On a Sunset Drive from Tremisana we hadn’t seen a lot but then on our way to dinner at Marula Boma suddenly 6 lions walked right in front of us. It looked like they were hunting and they walked along the road for a few minutes and then walked back into the bush.That really shows that lucky timing plays a big part as the vehicle not far in front of us only saw a glimpse of them walking back into the bush after we called them back to the sighting. 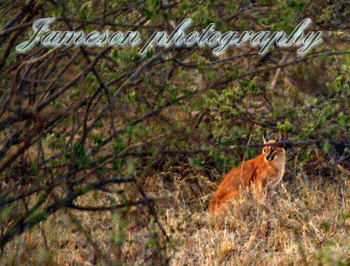 On a drive in the Balule we were extremely blessed to see a Caracal cat in the road ! Wow! My guests and I had been driving for a while and I heard their stomachs complaining for food. Just as I was about to pull over for breakfast there they were! 7 Lions right next to us – very relaxed. It was a male lion and his 6 cubs. Daddy was taking care of the kids while the mothers were out looking for some food. We got to spend a long time just watching the cubs play and daddy sleep. After a while we stopped and had a very good breakfast having a great view of the Drakensberg. One of the best days ever!!! We were out looking for animals when I received a phone call that we had lions at Tremisana !! I immediately got there as fast as possible. When we got there I realised they had made a kill!! Identifying the kill was problematic because there were 5 lions on one small thing. After sitting there for a while we got to see amazing behaviour and got beautiful photos. We later established it was a Bushpig – I have never seen a live Bushpig in the bush …..felt like crying. an extremely rare photo !!! Tremisana Lodge is pumping. Tremisana Dam is the only dam in the whole of Olifants West Game Reserve that still has substantial water. Animal activity is high and we had two lion kills this month. One kill was by 5 lions of a Bushpig – so we are sad as the Camera Trap had a pic of 3 baby week old piglets suckling from their mother. The elephants have all but destroyed the Bougainvilleas planted over 20 years ago along the fence. This month was very hot. We had some real summer days with temperatures above 40 degrees. Also we had our first rain for this summer. That was nice but the bush needs more rain. It’s still very dry. So every day we have a lot of visitors at the water hole in front of the lodge: vervet monkeys, baboons, warthogs and elephants. In the late evening we got visits from a civet and sometimes a leopard. The guests enjoyed the swimming pole during the hottest time of the day. It was also the month of a very close visit from our bull Elephant Soxangane. He almost touched the fence while he was feeding on the nice green bushes and flowers just outside the fence. The guests and staff enjoyed the sighting of this beautiful bull. At the end of the month we saw the first baby monkey in camp. So there was new life but we also lost a life. One of the bush pigs which live around the lodge got killed by the lions. We welcomed a new member in the office. Lianne runs the office and takes care of all the bookings, arrivals and leaving of the guests and she answers the phone and e-mails. Vanessa reports that October has been a very exciting month for the guests here at Marc’s Camp. Although we are eagerly still waiting for the rains to come and bring back the lush greenery, it hasn’t stopped the bush from its thrilling animal presence. The Nyalas are quite heavily pregnant now and we expect them to give birth during the month of November, but on the other hand the Vervet Monkeys have already started to double the numbers of the resident troop around the camp. Although these monkeys continue to give us grief at breakfast time, trying to steal a piece of fruit or two, we can’t help but notice how adorable their little babies are. It’s only a matter of time before these youngsters learn how to create havoc. We have not had as much buffalo or rhino activity around the area as we would like. With the lack of rain the reserve continues to supplement their food in order to preserve the remaining grasses. The feeding stations are on the far side of the reserve, which means for the time being the animals are staying over that side…….not that I blame them. Hopefully next month they will start to make their way back. The riverbed is still quite active, especially during the early mornings and evenings when the temperature is a little cooler. Many of the guests can look out their balconies and find an abundance of wildlife ranging from Nyala, Kudu, Waterbuck, Giraffe, Zebra, Impalas, Wildebeest and more. The giraffe seem to be quite a hit for the guests, especially in the mornings browsing around the treehouses, which really gives an appreciation of how tall these animals are when they are head level with the rooms. As you will read from the guides reports of all the amazing sightings they have had over the last month, particularly in Kruger, I can honestly say we have had the guests returning from their daily activities very happy and excited after what they have seen. They are always eager to show me their photos and videos and share their stories for the day. I have also been fortunate enough to have done a few Kruger trips myself and some drives on Balule this month – it’s great to get back out there and have some sightings of my own. We are busy pushing hard to get Katekani Lodge ready by 1 Jan 2016. We had a wonderful 3 day trip with Viva Safaris , staying at Tremisana Lodge. 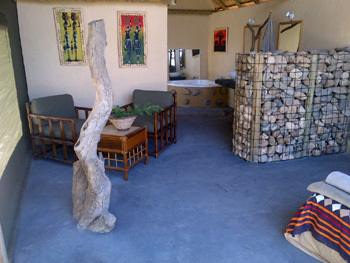 The Room were clean and neat , with nice hot shower to enjoy after a full day Kruger Safari. 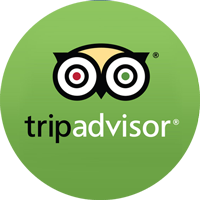 Staff is very friendly and really go out of their way to make you feel welcome. 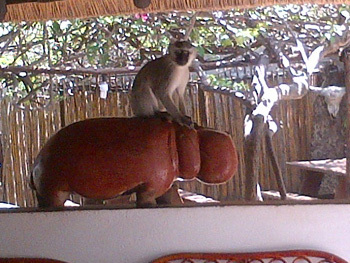 We enjoyed the monkeys right outside our room as well as the Boma dinner under the Marula Tree. The Safari in the Kruger was excellent thanks to Luke who answered all our questions and went out of his way ( with lots of patience’s) to find all of the Big 5 for us. I would love to go back to also stay in one of the Tree houses at Marc’s Treehouse to be even closer to nature. Thank you Trevor! We booked through Detour Africa travelling in late September/early October and stayed at both Tremisana and Marc’s Treehouse. Tremisana was lovely but Marc’s treehouse was favourite. We stayed in Treehouse 2 which overlooked the waterhole, what a fantastic view to wake up to each morning! Our first full day in the Kruger provided some great game viewing and we got a glimpse of a Lion but luckily we had a second day which was slightly cooler and perfect for spotting all the Big 5 and more, in fact the day could not have been better. 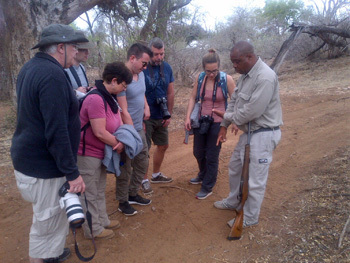 We also enjoyed visiting the rehabilitation centre and the private game reserves but our days in the Kruger were favourite. The accommodation at Marc’s treehouse was exactly as described and we wouldn’t have wanted to stay anywhere else, we were looking for the rustic experience and really liked the fact that the animals were happy to roam around the camp, including the naughty monkeys! Thanks to everyone at both lodges and also the guides who were knowledgeable and cheerful and made our holiday a memorable one.